In this lesson, we will learn how to solve equations that include radical expressions, where the variable is the radicand, by raising each side to a power. 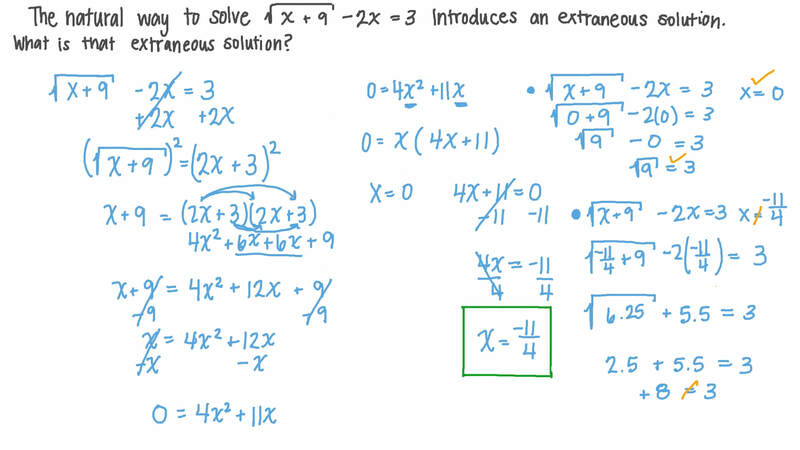 The natural way to solve √ 𝑥 + 9 − 2 𝑥 = 3 introduces an extraneous solution. 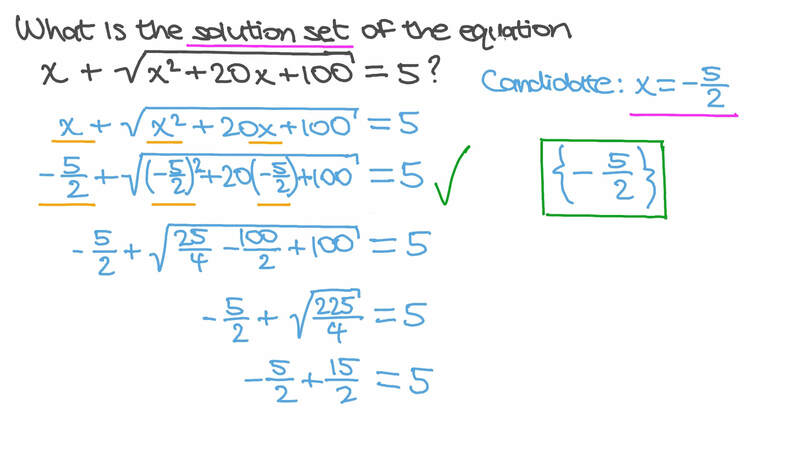 What is that extraneous solution? Solve √ 𝑥 − 5 = − 1 . Solve √ 𝑥 + 4 + 2 = 7 . Find the value of 𝑥 given that 3 √ 𝑥 = − √ 3 6 . Find the solution set of the equation − √ 𝑥 + 1 = 7 3 , given that 𝑥 ∈ ℝ . Find the value of 𝑥 for which √ 1 2 2 5 = √ 4 0 0 + √ 𝑥 . Given that 3  √ 𝑥 + 3 4 = 4 , find the value of 𝑥 . For what value of 𝑘 is 𝑥 = 1 introduced as an extraneous solution to the equation 𝑥 = √ 𝑥 + 3 + 𝑘 when it is solved in the natural way? What solutions did Fady find? Given that √ 7 + 1 8 9 = 5 + 𝑥 , find 𝑥 . 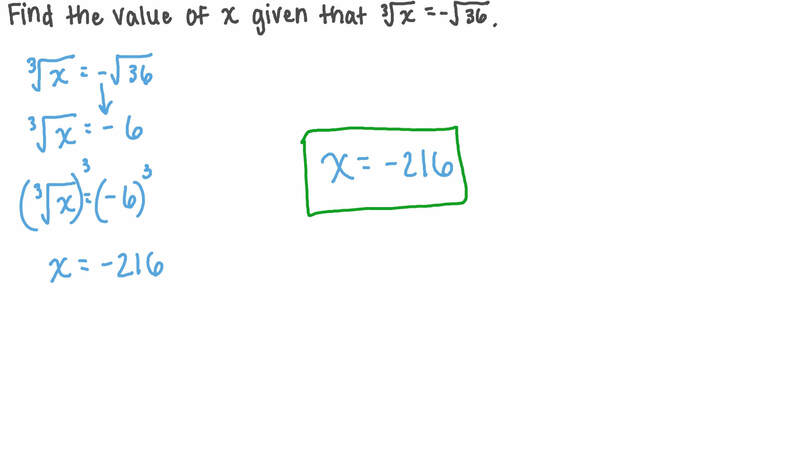 What is the solution set of the equation 𝑥 + √ 𝑥 + 2 0 𝑥 + 1 0 0 = 5 2 ? Solve √ 𝑦 = 4 0 . Find the value of 𝑥 given that 3 √ 𝑥 = 1 0 . Solve √ 𝑥 = 2 √ 7 + 5 . Find the solution set of  √ 𝑥 − 9  = 4 1 2 in ℝ . Solve | | √ − 0 . 5 1 2 | | = √ 𝑥 3 . Solve √ 𝑦 = 8 . 5 .